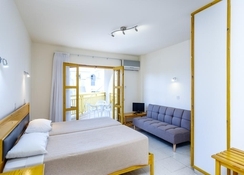 Pandream Hotel Apartments provides an excellent base from which to explore all that Paphos has to offer. The hotel itself resides just a few minutes drive from Paphos International Airport. Rooms here are well-decorated and comfortable with essential conveniences such as wi-fi, private balcony, telephone, air-conditioning as well as a kitchenette so you can dine, all of which helps to take the stress out of your holiday. 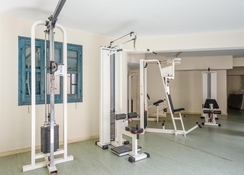 At Pandream Hotel Apartments, you will find a gym, tennis court, swimming pool, sauna and jacuzzi. Paphos’ exciting highlights include the Tombs of the Kings historic site, Paphos Zoo, Paphos Waterpark, two museums as well as many great bars and restaurants. Of course, a trip to Cyprus wouldn’t be complete without a day or two at the beach, thankfully the Pachyammos Beach provides fine golden sands and crystal clear Mediterranean waters for a fun and relaxing day at the beach. 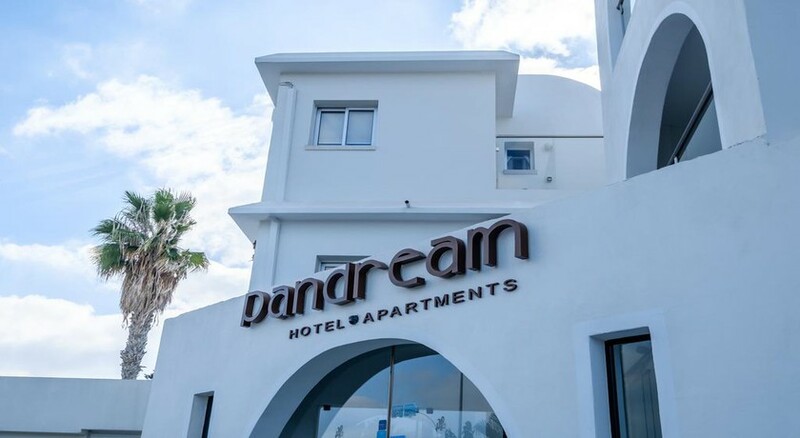 Pandream Hotel Apartments is just 16km from Paphos International Airport and only a short walk from Pachyammos Beach. It’s a location along Poseidonos Avenue, makes it an ideal base from which to explore Paphos and all its highlights. Short strolls up and down Poseidonos Avenue alone will take you past many top restaurants catering to tastes from around the world. 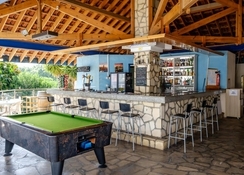 You will also find bars that afford magnificent views over the Mediterranean Sea. The main retail shopping centre, Kings Avenue Mall is just 4km away. Paphos Archaeological Park is to be found just 2km north along the coast and a little further up is the Tombs of the Kings and Paphos Waterpark can be easily walked to from Pandream Hotel Apartments. The 51 Guest rooms at Pandream Hotel Apartments feature clean, simple lines with well-appointed furniture, tasteful interior décor whilst being kitted out with modern conveniences such as air-conditioning, safe deposit box, wi-fi, TV, telephone and much more. Rooms here also come with a fully-equipped kitchenette for self-catering and dining in. They generally sleep two guests on a double bed. Larger occupancy can be found with a Superior One-Bedroom Apartment or Superior Studio Apartment. The main hotel restaurant serves an a la carte menu of international dishes and local favourite delicacies and serves a buffet breakfast. There is a poolside bar serving refreshments and some snacks. Conveniently, there is a supermarket on site which means it’s easy to make the most of the self-catering facilities. 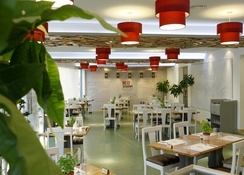 However, there are also a plethora of food and drink options within a short walk of the hotel. Try the freshest Mediterranean seafood at Ocean Basket or a good ol’ juicy burger at Fiesta Bar & Grill, which are next door to each other. There is also Italian, Indian and Chinese within an easy distance as well as many excellent bars. On-site, guests will be able to enjoy a dip in the outdoor swimming pool or relaxing under the Cyprus sunshine on one of the sun beds. There is also a shallower pool for children. Stay active at the gym or on the tennis court or unwind in the sauna or jacuzzi. Head out into Paphos and you will find a host of things to see and do with something for all the family, from Paphos Waterpark and Paphos Zoo to historic sites such as Tombs of the Kings and Paphos Archaeological sites. If you simply want to chill out on the beach, a short walk will take you to the fine golden sands of Pachyammos Beach. As we were staying out of season there were very limited facilities on site, although this was not a problem for us. Average rooms, abit noisy in the evenings, friendly staff, decent value for the money.